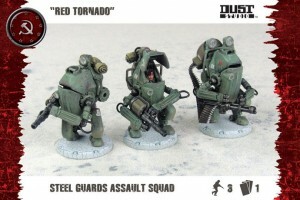 Battlefront (via the GF9 website) is showing off the Steel Guard Heavy Troops, nicknamed Red Tornado, for Dust Tactics. Thanks to the latest SSU human-enhancement technology, these once-crippled veterans have been given the chance to return to the front lines and continue the fight. The unit’s extensive combat experience is used to deadly effect – as are its massive Heavy Shotguns and 20mm Auto Gun. It’s no wonder that the incredibly resilient solders of the Steel Guards Assault Squads are among the most fared on the planet.